I can’t say enough good things about the experience we had at my event at Pirch. I’ve talked about their space and the wonderful event staff but I wanted to tell you more about one of the highlights of the evening: the cooking demo. I had never heard of salt block cooking but let me tell you, I am sold! 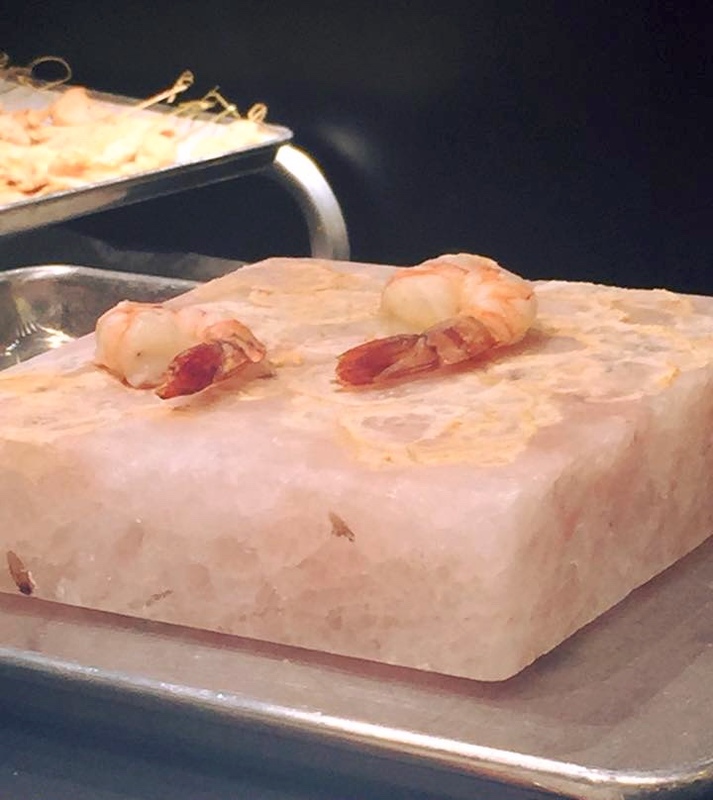 The chef made a really wonderful but simple shrimp dish on a pink Himalayan salt block; we we all really impressed by how he simply sauteed the shrimp on the heated block and it was really delicious, just lightly infused with salt. I found an interview with Mark Bitterman on The Splendid Table (a great cooking radio show and podcast) who wrote the book that our demo was based on: Salt Block Cooking 101 He explains the technique and how to care for your salt block. I have his cookbook and can’t wait to try making shrimp on it at home. I also noticed that it can be used on the grill, which is great since we are lucky in Atlanta to be able to grill almost year round, and also saw some really great looking cold salads like watermelon and feta in the book. 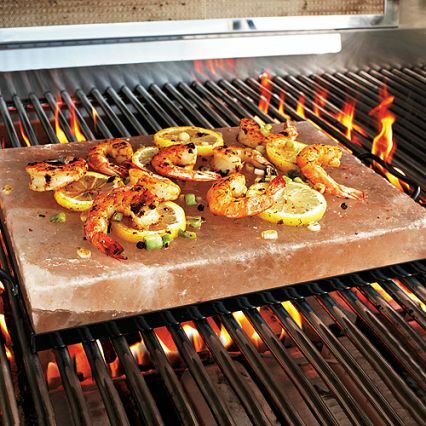 Grilling shrimp brings out their natural sweetness, and grilling them directly on a Himalayan salt block, imparts a subtle salty note to the shellfish. Make sure to heat the salt block slowly on the grill or in an oven to prevent cracking. Also make sure to give the block several hours to cool to room temperature before lightly scrubbing under running water. Prepare the Himalayan Salt Block: Place a completely dry Himalayan salt block on a cold charcoal or gas grill. Light grill and heat slowly to 400 degrees. Once grill reaches temperature, allow salt block to heat for another 20 to 30 minutes. Alternately, set salt block on a rimmed baking sheet, place on a rack in the center of a cold oven and heat to 400 degrees. Once oven reaches temperature, allow salt block to heat for another 20 to 30 minutes. To make the honey cracked pepper glaze: In a small saucepan, melt butter over medium heat. Add shallots and garlic and cook until shallots have softened, about 3 to 4 minutes. Add the honey, lemon juice and black pepper. Stir to combine, then taste and season with salt and pepper. Cook the shrimp: Using a silicone pastry brush, brush shrimp with glaze mixture. Place shrimp directly on salt block and cook until lightly browned, about 2 to 3 minutes. Using tongs, turn shrimp onto a clean spot on the block. Brush again with glaze and continue cooking until the center is slightly opaque, about 2 to 3 minutes more. To serve: Divide shrimp between 4 heated serving plates. Drizzle with 2 to 3 tablespoons of reserved glaze mixture and serve immediately. This entry was posted on October 23, 2015, 12:24 pm and is filed under Living. You can follow any responses to this entry through RSS 2.0. You can leave a response, or trackback from your own site.